Note: This is a superseded artist's impression. More recent renderings of the spacecraft are here. CHEOPS will search for transits of exoplanets using ultrahigh precision photometry. This will be the first mission dedicated to examining bright stars already known to host planets. CHEOPS is expected to launch towards the end of 2017 into a circular Sun-synchronous orbit, at an altitude of between 650 and 800 km. CHEOPS has one instrument – a photometer with a single CCD, operating between 0.4 – 1.05 µm, that is at the focal plane of an on-axis Ritchey-Chrétien telescope of 33cm diameter. 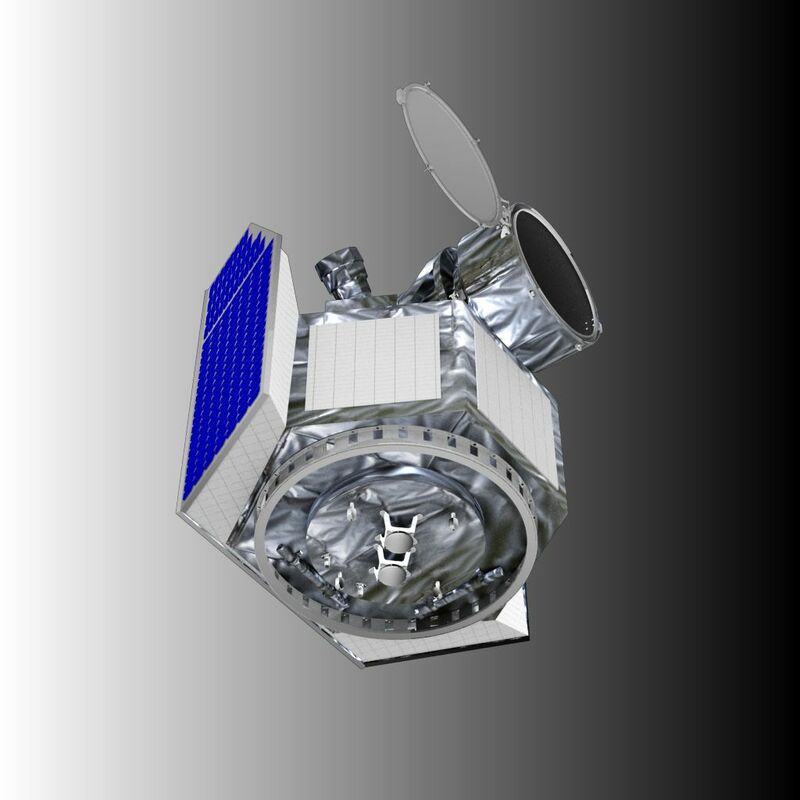 The blue solar panels cover the back and sides of the instrument and will always face the Sun. The silver-looking tube, with a black inside liner, is the Baffle and Cover Assembly (BCA). The grey disc connected to the end of the tube is the telescope cover. The large slotted grey ring is the launcher interface ring. This is used to connect the spacecraft to the launch vehicle for flight. The dimensions of the spacecraft are about 1.5m × 1.4m × 1.5m.